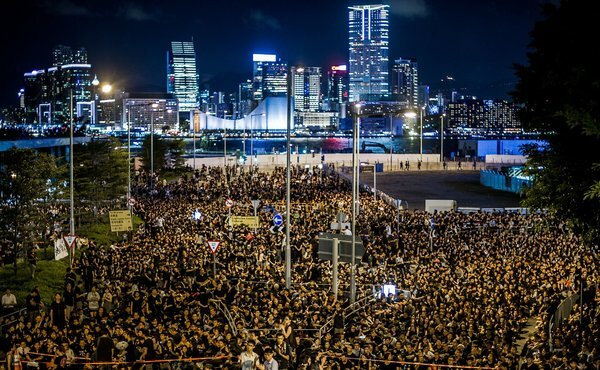 The white paper said the policy enjoys growing popularity in Hong Kong, winning the wholehearted support from Hong Kong compatriots as well as people in all other parts of China. It is also thought highly by the international community. The term “compatriot” eerily rings of communism: compatriot, comrade, communism… The phrase “wholehearted support” would explain the recent June 4th demonstration and the existence of groups like Scholarism, and the whole premise behind the recently-released documentary film, Lessons in Dissent. So China apparently has no regard for the concept of natural rights, not that that really is a new tidbit of information. And oh, the vagueness of the phrase “a high degree of autonomy.” It’s so intentionally vague, so delicately phrased so that both China and Britain could interpret it as they willed in order to allow the Sino-British Joint Declaration to smoothly come to pass as it did. I guess you could say Hong Kong people are patriotic. But to whom? If the term “patriotic” could be extended to a city, or if Hong Kong could become an independent country, as some hope, Hong Kong people are considerably patriotic. Hong Kong people, please fight for your rights. This entry was tagged Chinese Communist Party, democracy, Hong Kong, One Country Two Systems, People's Republic of China, White Paper. no one should trust CCP, only ignorant believe in them…they are full of liars and fraud. Reblogged this on News Hong Kong.